Try walking around with a child who’s going, “Wow, wow! Look at that dirty dog! Look at that burned-down house! Look at that red sky!” And the child points and you look, and you see, and you start going, “Wow! Look at that huge crazy hedge! Look at that teeny little baby! Look at the scary dark cloud!” I think this is how we are supposed to be in the world—present and in awe. Last week’s winter storm likely prompted a sense of wonder in your child–and maybe in you. The beauty of the fresh snow and the different ways it allows us to interact with our environment (if only slowing us down a bit!) are truly causes for wonder. These events are relatively rare, which makes them all the more inspiring. 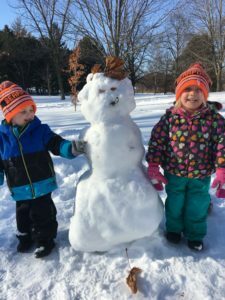 Though getting outside in the winter with small children can feel challenging, as discussed in this blog post, Bundle Up and Get Outside, there are so many benefits to doing so, especially for our physical and emotional health. From making snow forts and snowmen to sledding down neighborhood hills, bonding with family and friends to testing out new skills or seeing familiar sites transformed into something totally different (we can walk on lakes?! )…this is the wonder of winter to a child. At EFC, the snow gave children a chance to experience their playgrounds in a new way, and some classrooms even brought the snow inside to learn more about its properties. We hope you had a chance to experience the wonder of a Minnesota winter alongside your child. 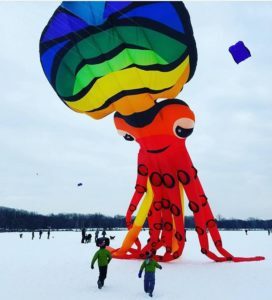 Kite Fest at Lake Harriet. Photo by Katie F.